Clinically proven to be superior to flax seed oil in improving a horse's overall omega-3 levels. Improves mobility & joint health. Excellent for skin health and coat sheen. Ahiflower® oil is the richest, most effective source of omega-3 and omega-6 fatty acids for optimal physical response. "Within ONE week, he was trotting around the field..."
• Ahiflower is clinically proven to be superior to flaxseed oil in improving a horse's overall omega-3 levels. Horses evolved to get their daily omegas through fresh pasture grazing, not fish sources. Ahiflower oil is a safe, balanced, and superior plant-seed omega 3-6-9 supplement oil backed by clinical trial data in performance horses. Grown entirely from non-GMO crops, Ahiflower oil is fully traceable, pure, and highly palatable. Horse owners seeking a complete omega to improve exercise recovery, joint and ligament health, coat luster, and stress responsiveness choose Ahiflower. Ahiflower® is a registered trademark of Technology Crops, LLC. Give 30-60 ml per day (1-2 pumps). Upon first use, remove protective closure and foil seal. Replace immediately with supplied piston pump. If pump is removed, replace with protective closure to minimize exposure to oxygen and preserve product freshness. Store in a cool, dry place. Use within 6-8 weeks of opening. For equine use only. Keep out of reach of children and other animals. In case of accidental overdose, contact a health professional immediately. This product should not be given to animals intended for human consumption. Cautions: Safe use in pregnant animals or animals intended for breeding has not been proven. If animal's condition worsens or does not improve, stop product administration and consult your veterinarian. An examination from a veterinarian is recommended prior to using this product. Consult a veterinarian if your animal has a coagulation disorder before supplementing with Ahiflower oil. In a recent clinical study with race horses in Canada, horses who consumed Ahiflower oil for 10 weeks had up to 10x better omega-3 EPA and DHA conversion than horses who consumed flaxseed oil. Further, the race horses consuming Ahiflower oil had notably better anti-inflammatory biomarkers than horses consuming flaxseed oil. The study was conducted at the University of Prince Edward Island's Atlantic Veterinary College. Since Ahiflower Equine oil is not from from fish, horse owners who switch from cod liver or other fish oils to Ahiflower Equine oil will save approximately 750 x 100-gram oily fish (like sardines, anchovies, or mackerel) for every 1 liter of Ahiflower Oil for Horses they give to their horses. New equine research carried out at the Atlantic Veterinary College (PEI, Canada) found that Ahiflower oil showed improved long-chain fatty acid conversion vs. flaxseed oil. Q: I've never heard of Ahiflower® Oil for Horses before. What is it? A: Ahiflower Oil for Horses is a new plant-based omega-3-6-9 oil that comes from seeds of a plant whose botanical name is Buglossoides arvensis. Ahiflower oil has a similar consistency to flaxseed or camelina oils, but it is much more biologically active due to its unique omega-3-6-9 fatty acid composition. Ahiflower oil is vegan (not from fish! ), non-GMO, and fully traceable to the farms where the oilseed crop was grown. 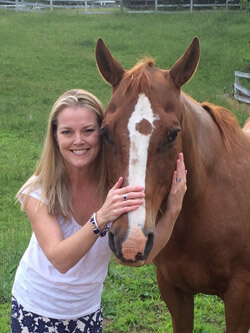 Q: I currently use flaxseed oil and/or fish oil as an omega-3 supplement for my horse(s). Why should I switch to Ahiflower Oil for Horses? A: In a recent clinical study with race horses in Canada, horses who consumed Ahiflower oil for 10 weeks had up to 10x better omega-3 EPA and DHA conversion than horses who consumed flaxseed oil. Further, the race horses consuming Ahiflower oil had notably better anti-inflammatory biomarkers than horses consuming flaxseed oil. The study was conducted at the University of Prince Edward Island's Atlantic Veterinary College. Since Ahiflower Oil for Horses is not from fish, horse owners who switch from cod liver or other fish oils to Ahiflower Oil for Horses will save approximately 750 x 100-gram oily fish (like sardines, anchovies, or mackerel) for every 1 liter of Ahiflower Oil for Horses they give to their horses. Q: I'm not currently using any omega-3 feed supplement for my horse(s). How can I tell if my horse may benefit from taking Ahiflower Oil for Horses? A: Many active and retired horses experiencing post-exercise stiffness, joint/muscle strain, respiratory allergies and/or skin challenges are recommended to try omega-3 supplementation. In horses and humans alike, omega-3 deficiency prolongs exercise recovery time and suppresses a healthy immune response. Ahiflower oil has been shown to convert to omega-3 EPA and DHA in horses far more efficiently than flaxseed oil. Ahiflower Oil for Horses supports your horse's natural post-exercise response for improved mobility and suppleness, while also supporting wonderful skin health and coat luster. Q: Does Ahiflower Oil for Horses contain any banned substances? A: No! Every master batch of Ahiflower Oil for Horses is independently 3rd-party tested for banned or performance-enhancing substances in international competition. There are no banned substances in Ahiflower Oil for Horses. Further, no competition horses taking Ahiflower Oil for Horses have ever tested positive for banned metabolites in their blood. Q: How much mint oil is used in Ahiflower Oil for Horses? A: We add 1% by weight natural mint oil to our Ahiflower Oil for Horses. This is equivalent to about 9 grams mint oil per 1 liter of Ahiflower Oil for Horses or about 27-54 mg mint oil per 30-60 ml (6-12 tsp) daily ration. We add this solely to improve palatability for horses and not for any therapeutic purpose—and horses love it! Q: What is the mint oil made from? A: The mint oil is a proprietary blend of human food-grade mint extracts combined into non-GMO soy oil. The product is Kosher certified. Q: How palatable is Ahiflower Oil for Horses? A: Very! Ahiflower oil by itself has a very clean, neutral flavor. We add a small amount of natural mint flavor and horses universally love it! Q: Can I take Ahiflower Oil for Horses myself—is it "human" grade? A: Ahiflower Oil for Horses is made from human-grade Ahiflower oil. You could certainly consume Ahiflower Oil for Horses (up to 1 tsp/day) but we recommend the more convenient Ahiflower for People. Q: Can I give Ahiflower Oil for Horses safely to pregnant or nursing mares? A: We recommend that you consult with your veterinarian before giving any omega-3 supplement to a pregnant or nursing mare. Q: Can I give my dog Ahiflower oil? Ahiflower Oil for Horses or Ahiflower Oil for People will be fine to give to dogs. Palatability of the equine oil will depend on whether a dog likes natural mint flavor—some dogs will and some may not. We suggest mixing Ahiflower® oil into your dog's wet food and/or dry food with a little water added to emulsify the oil. For a dog's daily dosing we would recommend 1/4 tsp (1.25 ml) for every 20-25 lbs body weight or 1 softgel (750 mg) for every 15 lbs body weight. Note that domestic cats lack the delta-6 desaturase liver enzyme for metabolizing alpha-linolenic acid (ALA). Therefore we do not recommend giving Ahiflower oil to cats. Q: Is there a shelf life? A: Yes. Ahiflower Oil for Horses has a lot number and a Best Before date on the side or bottom of the bottle. While we do not guarantee the quality of Ahiflower oil beyond the Best Before date, as with many non-perishable consumer products, crossing this date does not automatically mean the product is unsafe. Our Best Before date signifies when the product may no longer meet all our exacting standards for oil quality, flavor, and aroma. Therefore please consume it within 6-8 weeks of opening and store out of direct sunlight in a cool dark place. Ahiflower Oil for Horses does not require refrigeration. Q: How should I store Ahiflower? A: Ahiflower oil should be stored on a shelf in a cool place in your feed room away from direct sunlight. Q: I left the lid off my Ahiflower oil bottle overnight. Is it still good to use? A: Yes, it should be fine. Keeping the bottle closed helps to limit the product's exposure to oxygen. Check the product's odor before using it—if it has a rancid or noticeably fishy odor then discontinue using that bottle. Q: I left my Ahiflower in the car and it's been warm lately. Is the product still ok? A: If the Ahiflower oil bottle has not been opened it should be fine, however prolonged hot conditions can cause a partially-used product to oxidize more rapidly. Check the product's odor before using it—if it has a rancid or noticeably fishy odor then discontinue using that bottle. Q: Who can I contact with questions about proper storage, handling, or other technical concerns? A: One of our technical support members should be able to help you. Please contact us by e-mail (feedback@springtimeinc.com) or call the toll free number 800-521.3212. Deeds can ride in comfort. Kristen and Deeds love the sun. Two years ago, the vet found a floating chip in the front left foot of my now 24-year-old quarter horse, Deeds. The chip was off of his navicular bone, and was life-threatening. The next set of X-rays showed even more degeneration and the vet recommended euthanasia. She said to keep him comfortable because at this point there is nothing else that could be done for him. I was devastated. I agreed, but as always it is hard to euthanize an animal that still seems so full of life. I decided to research more about navicular, bone chips, and natural remedies. That is when I came across Springtime and found Ahiflower Oil. And THANKFULLY I did. Although he is sometimes a picky eater, he ate it. I am happy and overwhelmed with joy to say that within ONE week, he was able to maintain normal mobility. The vet, barn owner and other boarders were texting me telling me "I just saw him buck" and "did you know he is trotting now?" They sent me so many videos of him frolicking and even cantering! Unbelievable! 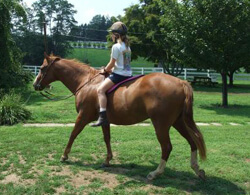 It has been 4 months that my horse has been on it. He is a different horse. This stuff WORKS and I highly recommend it! He can even tote small children around for brief rides (his favorite thing to do). New X-rays show no changes for the worst. With no other options, Ahiflower Oil helped my horse maintain optimal health!